"Huge laughs and great science—the kind of smart, funny stuff that makes Jon Scieszka a legend." Kid-genius and inventor Frank Einstein loves figuring out how the world works by creating household contraptions that are part science, part imagination, and definitely unusual. In the series opener, an uneventful experiment in his garage-lab, a lightning storm, and a flash of electricity bring Frank’s inventions—the robots Klink and Klank—to life! Not exactly the ideal lab partners, the wisecracking Klink and the overly expressive Klank nonetheless help Frank attempt to perfect his inventions.. . . until Frank’s archnemesis, T. Edison, steals Klink and Klank for his evil doomsday plan! "In the final analysis, this buoyant, tongue-in-cheek celebration of the impulse to ‘keep asking questions and finding your own answers’ fires on all cylinders." "Scieszka mixes science and silliness again to great effect." "In refusing to take itself too seriously, it proves that science can be as fun as it is important and useful." "With humor, straightforward writing, tons of illustrations, and a touch of action at the end, this book is accessible and easy to read, making it an appealing choice for reluctant readers. A solid start to the series." 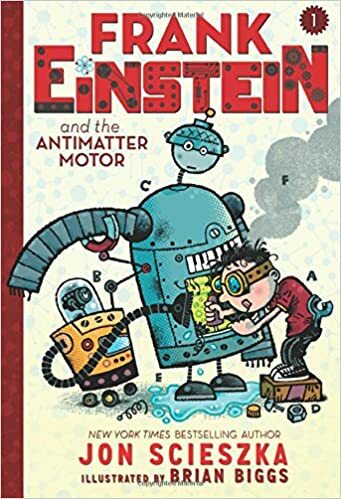 "Kids will love Frank Einstein because even though he is a new character he will be instantly recognizable to the readers...Jon Scieszka is one of the best writers around, and I can't wait to see what he does with these fun and exciting characters." "Jon Scieszka's new series has the winning ingredients that link his clever brilliance in story telling with his knowledge of real science, while at the same time the content combination of fiction and non fiction appeals to the full range of the market."